EIGHT JHĀNAS – In the Pāli canon the Buddha describes eight progressive states of absorption meditation or jhāna. Four are considered to be meditations of form (rūpa jhāna) and four are formless meditations (arūpa jhāna). The first four jhānas are said by the Buddha to be conducive to a pleasant abiding and freedom from suffering. The jhānas are states of meditation where the mind is free from the five hindrances — craving, aversion, sloth, agitation and doubt — and (from the second jhāna onwards) incapable of discursive thinking. The deeper jhānas can last for many hours. Jhāna empowers a meditator’s mind, making it able to penetrate into the deepest truths of existence. There are four deeper states of meditative absorption called “the immaterial attainments.” Sometimes these are also referred to as the “formless” jhānas (arūpa jhānas) in distinction from the first four jhānas (rūpa jhānas). In the Buddhist canonical texts, the word “jhāna” is never explicitly used to denote them, but they are always mentioned in sequence after the first four jhānas. The enlightenment of complete dwelling in emptiness is reached when the eighth jhāna is transcended. Fourth Jhāna – In the fourth jhana there are – “a feeling of equanimity, neither pleasure nor pain; an unconcern due to serenity of awareness; unification of mind, contact, feeling, perception, intention, consciousness, desire, decision, persistence, mindfulness, equanimity & attention”. 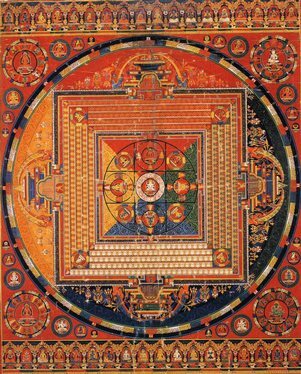 eighth jhāna: neither perception nor non-perception. This has to be understood. In the fourth rupajhana, there is already Upekkha, equanimity and Ekkagata, concentration, but the mind is still focused on a “material” object, as any color. In the fifth jhana, the meditator discovers that there is no object, but only an infinite space, which is empty. This perception motivates the interest of claiming arupajhanas. In the sixth jhana, it becomes obvious that space has no existence. There is only infinite consciousness. In the seventh jhana appears the feeling that there is no consciousness, but nothingness. The eighth jhana consists in the most discrete possible state of mind, which justifies the using of “neither perception nor non-perception”. These “explanations” do not refer to any intellectual, philosophical comprehension, which disappear since the second jhana. They attempt to figure mental process. The arūpajhānas are part of the kammatthanas, and are referred to as the four “formless states”. Some Tipitaka texts identify arūpajhānas as a part of the fourth rūpajhāna, as they include two elements: upekkhā (Sanskrit: upekṣā) and ekaggatā (Skt: ekāgratā). Upekkhā is a Pali word meaning equanimity. The opposition between comfortable sensations and uncomfortable ones disappears. More importantly, it is one of the fourth Jhāna’s factors, present only in this Jhāna. Ekaggatā or “singlepointedness”, as a Jhāna’s factor, simply means a very deep concentration, which includes the ceasing of stimuli from the exterior world. It is the only jhānic factor present in each Jhāna.